What is the Greatest Invention of All Time? Many people ask what is the Greatest Invention of All Time? And just as many people have different ideas about the answer to this question. Contenders for this subject include the Internet or the World Web, the Computer, the alphabet or the Printing Press. Others believe that the Car ranks as the Greatest Invention of All Time whilst people argue in favor of the cell phone, video games, the movies or the Television. It's all a matter of personal opinion, priorities or choice. Labor saving devices such as the washing machine, refrigerator or microwave might rank as a favorite whereas kids would prefer video games or even Santa Claus! The list goes on and on! But what do we believe is the Greatest Invention of All Time? It's only our opinion, but we believe that FIRE is the greatest discovery of all time and that the use of fire led to many of the Greatest Inventions of all Time. Greatest Invention of All Time - Why Fire? Fair question! We believe that fire was incredibly important because it supplied humans with the most important necessities of life - warmth, light protection and the ability to cook food. The most basic need of humans is for physical survival requiring water, food, warmth, rest, security and safety. Psychological needs such as prestige and self esteem are secondary (refer to Maslow's Hierarchy of Needs). This article provides details of the benefits and inventions of why we believe that fire is the Greatest Invention of all Time. Fact 1 about the Greatest Invention of All Time: The earliest humans had knowledge of fire and witnessed its power in natural phenomenon such as fires caused by lightening strikes, forest fires or wildfires, deposits of natural gas, burning oil fields and the eruption of volcanoes. Natural fires produced heat and light but people were not aware how to harness or control the power of fire. Fact 2 about the Greatest Invention of All Time: Early men, like animals, were at first frightened of fires. To witness a burning, flaming forest fire must have been terrifying. To touch fire would result in a painful burn. Fact 3 about the Greatest Invention of All Time: It took a very brave man to attempt to 'capture' fire but man's natural curiosity and ingenuity, together with the realization that fire could hugely benefit the clan, led to the harnessing of the first fire. Fact 4 about the Greatest Invention of All Time: Evidence of the use of fire by the earliest humans presented itself in the form of burned bones and hearth-like depressions in cave floors. Fact 5 about the Greatest Invention of All Time: The courageous quest for fire involved finding ways of safely collecting smouldering embers or burning coals. It is believed that this was done by carrying these objects in a container full of ash. Fact 6 about the Greatest Invention of All Time: Can you imagine the effect that fire had on the people of the clan? When darkness fell their caves still had light. And fire produced heat that kept them warm on bitterly cold nights. Fact 7 about the Greatest Invention of All Time: At this time in history man did not have the knowledge of how to produce fire and the precious commodity had to be carefully guarded and fed with wood to ensure the fire did not go out. Fact 8 about the Greatest Invention of All Time: The introduction of fire to the caves used by people of the Stone Age ((3000 - 1800 BC) led to many important inventions and discoveries that improved the lifestyle of the people. Fact 9 about the Greatest Invention of All Time: One of the first inventions related to fire was the torch. Originally the only source of light was from the hearth but it was soon discovered, either by accident or design, that fire was portable. The first torch was invented using bark or cane torches, with bark fibers were bound with bits of cordage. Later hollowed-out animal bones were used for this purpose. The invention of the torch allowed people to burn one stick at a time instead of a whole pile of wood to produce artificial light. Fact 10 about the Greatest Invention of All Time: Another important discovery was that fire could be used to frighten savage animals and used as a means of defence adding to the security and safety of the people. Fact 11 about the Greatest Invention of All Time: The other great advantage of the domestication of fire led to the discovery that cooked food tasted much better than raw food. The food was cooked over open fires and led to the development and invention of simple cooking tools. Stone Age man also invented the process of preserving meat with smoke. Fact 12 about the Greatest Invention of All Time: The invention of lamps followed the invention of the torch when a clever inventor realized that the wooden holder of the torch could be discarded entirely and only the grease in a more solid container could be used. The first lamps were containers made of stone, bone or shell containing a inflammable liquid such a vegetable or animal fats (grease) together with a wick made from twisted cord, rolled leaves, lichen or moss. Lamps would burn for several hours at a time, much longer than a torch. 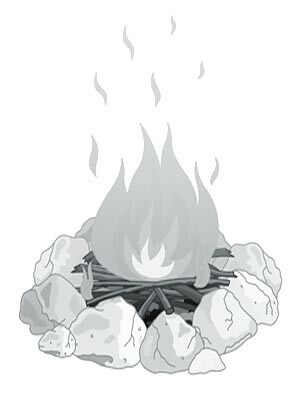 Fact 13 about the Greatest Invention of All Time: Stone Age man left traces of their use of fire in the form of charcoal, ash, hearths, burned bones, lamps and most importantly fire-hardened stone tools. Fact 14 about the Greatest Invention of All Time: The use of stone to make tools led to Stone Age man inventing methods to make fire. This was an important invention it was impractical to travel with a lighted flame. Fact 15 about the Greatest Invention of All Time: Early man found that they could make fire by striking two hard pieces of stone together, such as pyrites or chert, which produced a spark caught on tinder and blown to a flame. Another method of making fire was to rub two pieces of wood together. A whirling movement and pressure produced a fine wood dust and a spark would appear that was caught on tinder and blown to a flame. Fact 16 about the Greatest Invention of All Time: More sophisticated inventions were made to produce fire involving the use of a hand drill, bow drill and pump action drill. Man had conquered their need to make fire and opened the possibility of further inventions. Fact 17 about the Greatest Invention of All Time: The invention of bronze made by smelting tin and copper was only possible due to man's ability to harness the power of fire which elevated people from the Stone Age period in history to the Bronze Age (1800 - 600 BC) and the invention of various metal weapons. Fact 18 about the Greatest Invention of All Time: People invented the process of firing clay to obtain earthenware objects and went on to fire pottery with white paste, in order to produce ceramics. Fact 19 about the Greatest Invention of All Time: The invention of glass was made by heating ordinary sand until it melts and turns into a liquid. Without glass there would be no spectacles, telescopes, microscopes or light bulbs. Fact 20 about the Greatest Invention of All Time: The invention of steel would not have been possible without which there would be no railroads, skyscrapers, the elevator and numerous other smaller items like the paperclip that makes our everyday lives easier. Fact 21 about the Greatest Invention of All Time: Users of internal combustion vehicles employ fire every time they drive. Gas turbines, jet engines and most rocket engines all have internal combustion engines and firearms are also a form of internal combustion engine. None of these inventions would have been possible without fire. Greatest Invention of All Time: We hope that the facts in this article have provided the answers to all of your questions about the impact of fire, and why we consider it to be to be the Greatest Invention of All Time.